It is now 130 years since the 680-ton iron barque Lady Kinnaird sank off of Cape Burr, Port Neill on 21st January 1880. An anchor from the shipwreck is now located at Port Neill. A photo of the anchor can be found at http://www.tumbybay.sa.gov.au/site/page.cfm?u=238&c=179 . The Society for Underwater Historical Research published a report (prepared by Alan Hale) titled “The wreck of the Lady Kinnaird, January 21st 1880” on the wrecks centenary in 1980. 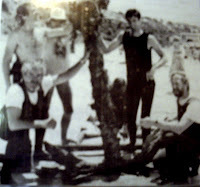 A young Alan Hale is shown at the far right in the above photo of an anchor retrieved from Fishery Bay.